These terms and conditions govern your use of our website. By using our website you accept these terms and conditions in full. If you disagree with any part of these terms and conditions, do not use our website. You may view, download for caching purposes only and print pages from website for your own personal use only. The information on this website is provided free-of-charge and you acknowledge that it would be unreasonable to hold us liable in respect of this website and information on this website. To the maximum extent permitted by application law we exclude all representations, warranties and conditions (including, without limitation, the conditions implied by law of satisfactory quality, fitness for purpose and the use of reasonable care and skill). However, nothing in these terms and conditions shall excluded or limit our liability for fraud, for death or personal injury caused by our negligence, or for any other liability which cannot be excluded or limited under applicable law. These terms and conditions, together with our Sales of Goods policy constitute the entire agreement between you and us in relation to your use of our website, and supersede all previous agreements in respect of your use of this website. This notice will be governed by and contrued in accordance with German law, and any disputes relating to this notice shall be subject to the exclusive jurisdiction of the courts of Germany. 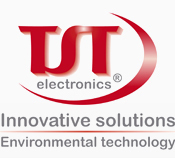 The full name of our company is TST electronics GmbH. Our address is Berliner Str. 42, 58135 Hagen, Germany. You can contact us by email to info@tste.de.